While the Pulp Revolution has been around for a couple of years now, it isn't the only literary movement focused on pulp fiction. Indeed, it's not even the first. Before PulpRev came New Pulp, which Pro Se describes as "fiction written with the same sensibilities, beats of storytelling, patterns of conflict, and creative use of words and phrases of original Pulp, but crafted by modern writers, artists, and publishers." PulpRev itself is attempting to define its own aesthetic, by studying the pulp classics. Reading ePulp Sampler Volume 1 by John Picha, I'm reminded of what pulp is not. Our ePulps re-imagine the world of the pulps in modern language, for a modern audience... They are unflinching in their depictions of violence and graft, and seek to show the "good old days" as they really were. By unmasking the true visage of a romanticized era, we hope to reveal a doppelganger of our own time. The Pulp Magazines of the 1930s and 1940s became outlets for the frustrations of a culture beaten down by the greed and ineptitude of the elites... Our ePulps carry on the real pulp family legacy, with an eye to reveal the stark realities of evil and corruption without the restrictions of corporate censorship. Bold promises. Yet when I read the sampler, I couldn't help but compare to the other pulp stories I have read -- and found the ePulps wanting. The collection opens with Rurik of the Demonwatch: Arena of Death by Russ Bopp. In this story, the titular Rurik is captured as he passes through the lands of Empress Sabula on an urgent mission. To win his freedom, he must fight gladiators and hell-pigs to the death in a blood-soaked arena. To the author's credit, he tries to live up to the muscular, energetic prose of Robert E Howard's Conan and Solomon Kane series. But prose alone is not enough. The reader is repeatedly told that Sabula is 'the incarnation of evil', yet the only evil seen on the page extends only to mundane gluttony and throwing Rurik into the dungeon. There are no powerful demons to slay, and the story resolves in a most anticlimactic fashion. By story's end, Rurik has defeated no great evils nor displayed any extraordinary virtue. By contrast, the Conan stories make a sharp distinction between the decadence of civilisation and the straightforward simplicity of a barbarian life, while Kane hunts murderers and bandits and slavers and monsters. In the hands of a pulp writer, the opening would be a set-up for an outsider to lead a coup against a corrupt monarch and bring the evil to justice; here there is only bloodsport, and action with neither consequence nor impact. I hesitate to call the second tale, Dead Reckoner: October 21, 1917 by Matthew J Davis, a story. It begins with a dry, straightforward recount of the travails of Anaxander Jones, who enlisted in the British Army at 18, was captured by the Zulu, and cursed by a powerful sorcerer. He is magically transported to the Battle of Ypres in 1917, and wanders across the frontlines. There he witnesses the horror of machine guns, trench warfare and poison gas -- and shortly after, he is whisked away into the void again. There is misery and bloodshed by the bucketloads, but there is no story. It is a series of events happening to Jones. There is no goal and no conflict; Jones is simply travelling across no man's land until the spell kicks in again. Without a plot, there can be no story. Just a series of events. Pulp stories are the exact antithesis of this story, with clearly-defined goals and motivation, an exciting climax and a satisfying resolution. I confess I can't tell you what the third story, Wild Marjoram: The Pill by N. K. Grabe, was about. The story opens with a mysterious man telling mechanic Marjoram to take his brand new car out for a spin, Marjoram calmly following him because reasons, and suddenly someone tries to gun down the customer. Marjorie takes the wounded man to a brothel to be patched up, and the story devolves into walls of exposition. Oh, and while she takes a bath, a man walks in on her because he enjoys her scent, and after a brief conversation he just hangs around to deliver even more exposition. To the pulps, time is money. Every paragraph, every sentence, every word had to move the story forward. Exposition is kept to a minimum, or delivered as part of a dialogue or monologue. It takes too many pages to get to the shooting, and then the story just stops while a creepy man hangs around a naked Marjorie to talk about the state of the world and its history. This is not the pulp I know; the pulp stories would begin with the drive-by, then cut out all the fluff text and mix in the worldbuilding with the action and dialogue. Further, Marjorie's lack of resistance and agency is surprising; she's less a heroine of her story, more like a thing to be talked at so the reader can receive exposition. Without strong characters and strong forward momentum, I can't call this pulp. Pandora Driver: Blind Luck by John Picha tries to be vigilante tale. Told from an omniscient perspective, it follows four characters in the span of one evening: Pandora Driver, one of her assistants, a young woman from a finishing school, and a serial killer. As the serial killer hunts his latest prey, Pandora Driver must come to the rescue. There is still a lot of exposition, but at least it's kept to a manageable amount. The writer insists on marking the character's thoughts with the double inverted commas reserved for dialogue; not only in this jarring, the thoughts drag on for so long that they resemble monologues or spoken lines instead of quick thoughts. Pulp masters would have kept the story tight, demonstrating thoughts through action or speech instead of stopping the story to deliver lines of thoughts. There is no conventional climax either, no final showdown between heroine and villain. Indeed, the resolution is made possible only due to sheer blind luck -- or, more likely, authorial fiat. This story is the kind of story you read if you have some time to kill -- but not the kind of story that'll stick with you. The last story, Skyracos: Set Adrift, also by John Picha, follows the exploits of two Skyracos, winged soldiers with the powers of flight, as they intercept an alien aerial dreadnought on a mysterious mission, set in the midst of a war between humans and aliens. It draws its influence from the madcap science fiction of the pulp era, with bug aliens, a strange world in another solar system, people flying everywhere, and lots of shiny tech. Once again, this story displays the same annoying tendency of marking thoughts as dialogue, but amps it up to eleven. The protagonist delivers an entire mission briefing as a 'thought' while he is soaring towards the alien ship, purely for the benefit of the reader. A pulp story would just get on with the story, delivering critical information as dialogue or in bite-sized chunks. There's also a fair amount of swearing here -- swearing that is conspicuously absent from the pulp stories I've read. Most damningly, there's no climax in this story either. The Skyracos discover that the alien ship is carrying the body of a fallen alien leader, and they decide to stand down as a gesture of goodwill. The aliens, in turn, allow the Skyracos to leave -- never mind that up to that point the Skyracos have carved a bloody swathe through the ship. Further, the story does not show why the aliens decide to choose peace without informing the humans in the middle of a war -- for if they had, it would have undercut the entire story altogether. Speaking of the anthology as a whole, there are many annoying typos that a decent spellcheck program would have caught. There are also mistakes like consistently swapping 'sight' for 'site'. 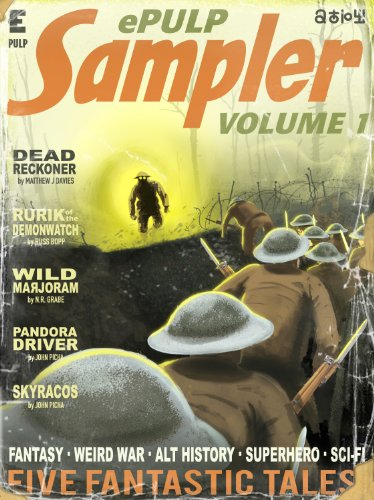 EPulp Sampler Volume 1 feels like the work of enthusiastic amateurs, designed to draw readers into reading their other work, as opposed to a carefully curated showcase of excellent pulp stories. Comparing the ePulp Sampler to actual pulp stories I've read, the former is woefully lacking. While the ePulps have character archetypes and settings familiar to pulp readers, these alone are not enough. Pulp stories are defined by constant forward momentum, clear story structure, moral values, character agency, meaningful action, mastery of prose and craft. This is the aesthetic PulpRev is shooting for, an aesthetic based on the craft of the pulp greats. Without this core, you do not have pulp -- you have mere pastiche. If you want an actual pulp-style story, featuring a blend of demons and magic and high-octane action, check out my latest novel HAMMER OF THE WITCHES. "Pulp stories are defined by constant forward momentum, clear story structure, moral values, character agency, meaningful action, mastery of prose and craft." You've got it absolutely right. Lee Child's Jack Reacher books are currently the biggest and most successful heirs of pulp that I can think of. They certainly meet your criteria. In SFF, perhaps Larry Correia's books, based on his first three MHI books.